Sugar companies are in such danger that the Ministry of Agriculture & Rural Development (MARD) on April 3 had to organize a meeting with the sugar association to discuss ways to rescue them. In the Mekong Delta, which has a large sugarcane growing area, farmers are desperate. After the failure of the 2017-2018 crop, thousands of households do not have more capital for the new farming crop. Many of them chopped down sugarcane plants to grow other crops. In Tra Cu district, the ‘sugarcane metropolis’ of Tra Vinh province, hundreds of hectares of sugarcane growing area have been used for aquaculture, rice and crop cultivation. According to the district’s agriculture sub-department, only 3,300 hectares of sugarcane exist this year, a decrease of 30 percent compared with the previous crop. Meanwhile, the Tra Vinh sugar refinery has spent big money to increase its capacity. Now with the sugarcane output decrease, it is likely to lack material for production. In Hau Giang province, despite the lower output caused by a smaller growing area (10,500 hectares), the sugarcane price has dropped dramatically to VND800per kilogram. With the price, farmers cannot make a profit. The 2018-2019 sugarcane crop is the third consecutive year that has a negative impacts from the weather and market conditions. Many companies can foresee losses because of existing problems: high inventory level, increased smuggling, and bigger imports of liquid sugar. Vietnam imported 46,000 tons in 2014, while the figure soared to 140,000 tons in 2018. 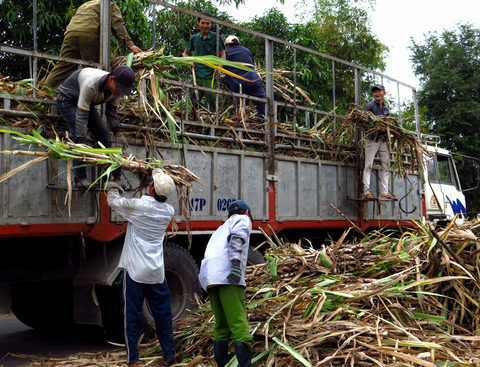 According to the Vietnam Sugar Cane and Sugar Association, the inventory volume has reached 650,000 tons, a record high level. Meanwhile, smuggled sugar remains a headache to domestic producers. Pham Quang Vinh, chair of Casuco, said Thailand makes 15 million tons of sugar a year, while its domestic demand is 2 million tons only. Thai sugar is sold across the border gates to Vietnam. Since the sugar doesn’t bear tax, it is VND1,000 per kilogram cheaper than Vietnam-made sugar. According to the sugar association, sugar companies are in danger of going bankrupt because the selling prices have fallen below the production cost, while the inventory volume remains high. Minister of MARD Nguyen Xuan Cuong suggested sugar companies make full use of bagasse and sugarcane by-products to generate electricity. According to the sugarcane association, in other countries, sugar is the major product of sugarcane, accounting for 60 percent, while the other 40 percent is used for electricity, alcohol and microbial fertilizer. Vietnam’s enterprises only make sugar, which increases the production cost.